I have a serious love for pencil skirts, they are one of my favorite things to wear. I also love peplum tops, especially this one! I decided to wear some things that I haven't worn in a long time, and I'm so glad I did. Sometimes we get so caught up in buying new clothes, don't get me wrong, I love shopping and I love new clothes! But we can totally get more than one use per piece of clothing, and I think it can be fun to try and style things differently each time. So even if the piece of clothing isn't new, it can feel new by pairing it with different items! Love this look Lily!! That peplum top is soooo beautiful! I am loving the blog Lily! Seriously can't wait until your next post comes out. I'll have to ask you tips on starting one. This is a great outfit! Loving the blue and green together! love that combo together!!!! You look AMAZING!!!! Super cute skirt. Love the bold stripes. Looks fantastic with the green peplum! I completely agree with you on that Lily. In fact, I repeat a few of the items I feature on my blog or take time to dig up my closet for items I haven't worn in a long time :) Lovely peplum top! 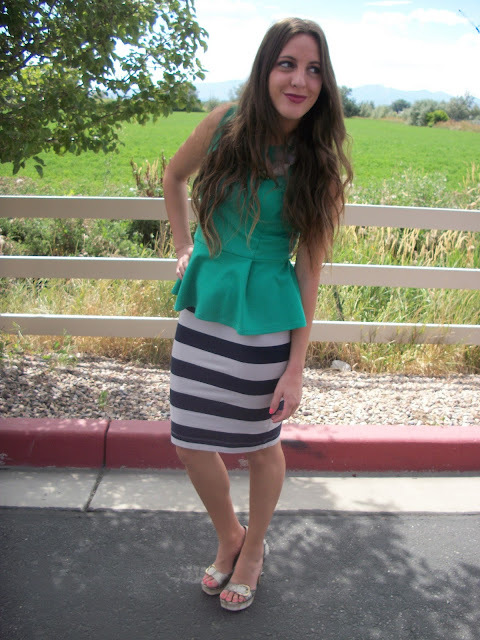 I love peplum tops and pencil skirts together! They go together so well. You look adorable in this outfit. Love it!